Hello. Sorry this place has been a bit quiet. But there’s a book coming. I’ve been horribly neglectful of this site of late. To be fair, I’ve been horribly neglectful of most things in my life for the last few months because I’ve been writing a book. And now it’s actually finished and is going to the magical book-making machine which I like to imagine is sort of like a whimsical Dr Suess illustration rather than what I assume is a large series of printing presses in an industrial warehouse in China or something. The release date is December 2015, making it both the perfect Xmas gift for any progressive type that you love, or the conservative that you are obliged to buy for but really want to annoy. If you’ve read my regular View from the Street column around the Fairfax sites – and to be honest, I can’t imagine why you’d be here if you didn’t – then you’re probably correctly imagining what’s in the book: snarky rants about how relentlessly silly the last two years of Australian politics has been. 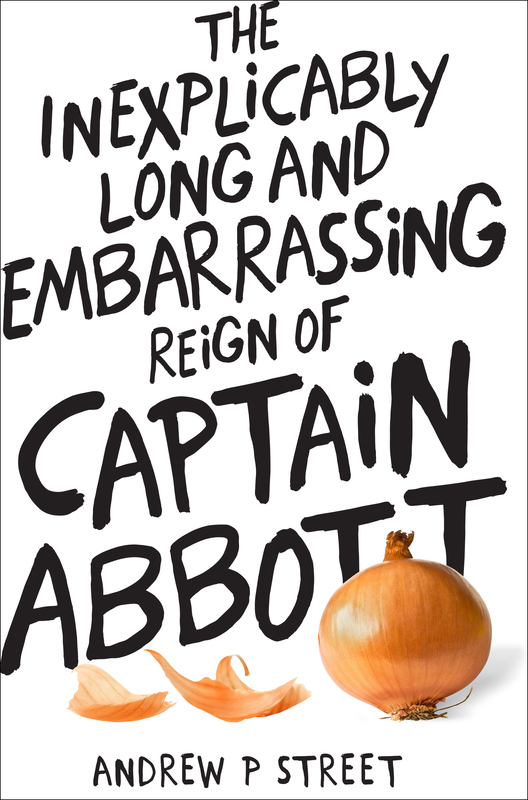 It’s an incomplete overview of many of the most frustratingly ridiculous things said (“I’m a fixer!”, “Poor people don’t drive cars!”, “People have a right to be a bigot!”, “I’m going to shirtfront Mr Putin!”), done (the onions! The helicopters! The submarines! Sir Prince Philip!) and legislated, from offshore detention to Direct Action and all the stupid points in between. And while it’s relentlessly snarky about Abbott and his merry band of largely terrible frontbenchers, there’s a larger philosophical point in there: we’re better off if we work together and look after one another, and that we can do so, so much better. I mention this because all this economic turmoil and political division isn’t a tough but unavoidable necessity: it’s a choice that we’re making, and we we can make different ones. A society is not the same thing as an economy, and pretending that the former is magically sorted out by fixing the latter is straight-up incorrect (not helped by the fact that this government is also failing at that, mind). But I won’t go on about that now: hell, I spent 320 pages going on about it in this thing you can read for yourself in a couple of months. And I do very much hope you like it. I’ve read it several times during the proofing process and still laughed at jokes I’d forgotten, which means that either there are some really good lines in there and/or I have early onset dementia. Time will doubtlessly tell. And now that I’m slightly less frantic, I might actually do more stuff on here. Let’s see how that pans out, eh?